Now thirty-four years old, Gülsüm Tatar may be Turkey's greatest ever boxer. But she has spent years struggling for respect, recognition, and support. 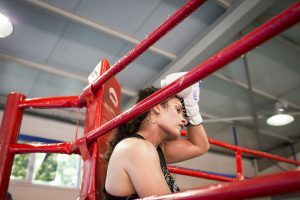 In the small, sleepy Belgian town of Roeselare, Gülsüm Tatar is about to step into the ring for the fight of her life. The Turkish boxer bounces on her feet, her jaw set and her face composed. With her coal black hair shorn at the back and sides and braided on top, she looks like a Mohawk warrior set for battle. Her name is announced, and she walks out into the lights, noise, and bombast of the arena to Major Lazer’s “Light it Up,” and climbs into the red corner of the ring. Gülsüm’s fighting name is şampiyon—champion. Now thirty-four years old, she may be Turkey’s greatest-ever amateur boxer. After a long and illustrious amateur career, she became Turkey’s first professional female boxer two years ago. 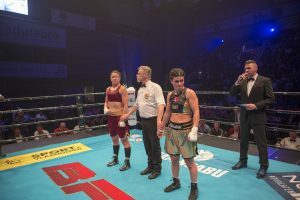 Tonight, February 16, a victory over the thirty-one-year-old Belgian fighter Oshin Derieuw—sixth in the world super-lightweight rankings—will catapult Gülsüm into the top ten and bring her a step closer to a major title fight. It is also another stage in her long struggle for recognition and respect for Turkish women’s boxing. Oshin Derieuw comes next, soaking up the cheers from her two-thousand-strong hometown crowd, and steps into the blue corner. It’s set to be a tough fight; both fighters are unbeaten in professional boxing: Oshin with ten victories, Gülsüm three. They meet in the center of the ring, lock eyes, touch gloves, retreat to their corners. And the bell rings. A few days before the fight, Gülsüm was involved in a blistering sparring session that surged back and forth over the sweat-stained floor of a small, ripe-smelling gym in Kadıköy, Istanbul. 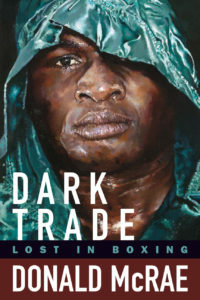 There was a row of heavy bags lining one wall, a pile of truck tires on the floor, and a small ring crammed into a dark corner—so close to the walls that fighters have to watch so they don’t bang their heads when they’re against the ropes. Gülsüm’s trainer urged her male sparring partner to hit her with more shots and more force. When the session ended, she sat on the floor, shiny with sweat, her chest heaving. As usual, she was feeling relaxed and confident. Gülsüm Tatar resting after a training session. She started boxing at the age of fifteen or sixteen after her brother, the boxer Serkan Tatar, began taking her to training sessions. Gülsüm was born in 1985 in Kars, in the cold, rugged far east of Turkey. Her family moved to Istanbul when she was a few years old. The harsh climate and high altitude in Kars produce many natural fighters, and boxing is in Gülsüm’s blood. Her uncle Kibar Tatar boxed in the 1988 Olympics. She grew up scrapping and wrestling with her four older brothers. Even so, boxing didn’t occur to her as something she would do. Gülsüm’s parents believed women should marry young and stay at home to raise children. They didn’t want Gülsüm involved in any sports, let alone boxing. 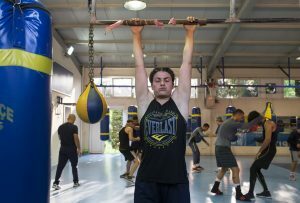 But when she was fifteen or sixteen, her brother Serkan—himself a promising boxer—began taking her with him to train at Fenerbahçe Boxing Club to keep her out of trouble and to use up some of her excess energy. She didn’t tell her parents. “The open-mindedness of my brother led me here to my life,” she said. In general, Turkey is a patriarchal, conservative country, with a terrible record on gender rights and equality. Much of Turkish society might balk at the idea of women boxing, worrying that it is improper or too dangerous. But Gülsüm has always found acceptance in the boxing gym. When she first started training, there were no other girls there, and the men treated her like any other fighter. She embarked on boxing’s brutal learning curve. When she took a sharp blow during sparring, she often couldn’t find the strength to fire back and, afterward, she would go and cry alone from the pain. Losing weight was hellish. But the frustration only made her more determined, and when her brother or a trainer gave her praise, her self-confidence grew and she craved improvement. She became stronger, her stamina increased, and she became a match for her sparring partners. Soon, she was lost to boxing. “When I could throw a punch properly, I felt like an immaculate, perfect person,” she said. The fighters twitch and feint, coiled with potential violence, observing each other warily. Gülsüm Tatar dances in her southpaw stance, slippery and confident, with an open guard, dominating the center of the ring. Oshin Derieuw, slightly crouched in an orthodox stance, jabs, and tests, her right hand cocked and poised for the slightest opening. The crowd falls quiet, and the canvas creaks with their shifting feet. They both fire controlled explosions of blurring shots, but few land cleanly. Gülsüm is looking more comfortable, and she sends a spearing left hand into Oshin’s stomach just as the bell ends the first round. Gülsüm Tatar in her southpaw stance against Oshin Derieuw. Tatar is twentieth in the world super-lightweight rankings. Derieuw, Europe’s top ranking super-lightweight, is ranked sixth in the world. Gülsüm had never fought a female fighter until the 2003 Turkish national championships. She remembers dominating that fight, but the decision went to her opponent. Her uncle jumped into the ring and started cursing and screaming that Gülsüm was being punished for his political dispute with the federation. Gülsüm was in tears; she didn’t understand what was happening. As a result of her uncle’s outburst, she was banned from the ring for several months. Gülsüm Tatar with her trainer Rıza Polat. Tatar has to balance her boxing training with a full-time job as a high school physical education teacher. But she quickly resumed a grueling training program, practically sleeping at the gym, racking up punishing rounds of sparring, developing into a fast, technical, and elusive fighter. When her parents found out she had been boxing they had shouted at her brother: “Why are you taking her boxing she’s just a girl!” But they couldn’t stop her. Her next fight was at the 2004 Turkish national championships. Her uncle stayed away, and she smashed through every opponent to be crowned champion. She was still only in high school. Later that year she won the European Championship gold medal. Gülsüm’s medal haul probably makes her one of the most successful Turkish boxers in history. Over her amateur career, she won thirteen Turkish national championships, three European championships, four EU championships, and she became the only Turkish boxer—male or female—to win two World Championship gold medals. Gülsüm stretching after training. After a fourteen-year amateur career boxing for Fenerbahçe Boxing Club, Tatar became Turkey’s first female professional boxer in 2017. In another country, perhaps she would have been a star like the Irish fighter Katie Taylor, Gülsüm’s old rival in the amateur ranks. Taylor is now lauded as one of the greatest female boxers of all time; she earns over $100,000 per bout (although it is a lot less than her male counterparts), most recently fighting at Madison Square Garden on Canelo Alvarez’s undercard. But as amateurs, Gülsüm beat Taylor on three occasions. Female fighters were allowed to compete in the Olympics for the first time in London 2012; it was a breakthrough moment for female boxing. But while Katie Taylor won a gold medal that kick-started her rise to stardom, Gülsüm was unable to qualify for a Turkish slot after she lost a qualification fight—she claims she was not given the support and backing she needed from the Turkish Boxing Federation. As well as often feeling disrespected and unsupported by the amateur boxing authorities, Gülsüm also says she was discriminated against because of her gender; she and three other female Turkish boxers have opened a legal case against the General Directorate of Sports. She believes she was due a reward of 90,000 Turkish lire for her 2004 European Championship gold but was only paid 9,000 TL. After she and the Turkish male boxer Fatih Keleş both won gold medals at the 2011 European Championships, she was paid 17,000 TL—a tenth of his fee. When Gülsüm was again unable to represent Turkey in the 2016 Rio Olympics, she had finally had enough of amateur boxing. In 2017 she turned professional and easily won her first few fights, all in Turkey. But being a professional boxer comes with its own set of problems. Boxing is not hugely popular in Turkey—women’s boxing, even less so. Gülsüm can’t attract significant sponsorship that could help her fight abroad. There is no professional boxing federation to offer support. She grew disillusioned of fighting in Turkey after some of her fights were canceled at the last minute, leaving her out of pocket. She has to balance her boxing training with a full-time job as a physical education teacher. Gülsüm should be fighting at least three or four times a year, but she can’t find a manager or a promoter, so she has to wait, growing restless, trying to stay fit and motivated, until foreign promoters approach her for a fight abroad. So when promoters in Belgium came calling in December with an offer to fight Oshin Derieuw, she jumped at the chance. Gülsüm Tatar makes weight; coming in at 63.4 kg on the scales in Roeselare, Belgium, the day before her fight with the local fighter Oshin Derieuw. Ahead of the match, the promoter Ian Redan was talking up the possibility of the winner fighting in the US later this year. “This could be a career defining fight,” he told me. As the rounds pass, Oshin becomes less cautious, putting together more combinations. Gülsüm still holds the center of the ring, jinking and throwing searching left hands. By the middle rounds, an egg-like lump protrudes from Oshin’s left temple. A shot from Oshin snaps Gülsüm’s head back; her right eyelid swells up. It’s an enthralling contest of technique, speed, and movement, but it’s hard to score. One punch can tip the balance or end the fight. Gülsüm Tatar caught by a left by her opponent Oshin Derieuw. Birol Topuz, managing director of Topuz Sports Management, argues that, in order for Gülsüm to reach her full potential and contend with the vastly greater standards of power and stamina in the highest echelons of professional boxing, she would probably have to leave Turkey and sign with a promoter and manager in a country with a better boxing infrastructure. “Amateur boxing and professional boxing may seem the same, but they are two different sports,” he said. Gülsüm Tatar with her husband Cem Kaptan at Roeselare train station. They have been married for almost five years. Gülsüm could keep boxing for a few more years; she has never had a serious injury, and she doesn’t like being hit, which always helps longevity. But it felt like she couldn’t continue in this semi-professional state for too much longer. So much is out of her hands. Usually, as a professional, if she beat Oshin she would be guaranteed exciting offers by managers and promoters, and if she lost she could keep fighting and take her next chance. But, as a female boxer in Turkey, you never know when your next opportunity might come. She certainly isn’t doing it for the money; the payment for women’s professional boxing matches is generally very low—certainly not enough to compensate getting punched repeatedly in the face or to make a living. But every time she thinks of quitting, she is pulled back in by the support of her husband, her love of boxing, the need to show the world her talent, and the desire to gain respect and recognition for women’s boxing and inspire others. Perhaps it also helps that she can readily smile at the sport’s many hardships and absurdities. At her flat in Istanbul a couple of weeks before the fight, Gülsüm had picked up certain medals from her glittering collection that covers an entire table, describing the feelings and memories they evoked, like the pride of winning her first World Championship in 2008. Then she lamented that they are only alloys—otherwise she could sell them and use the money to open a boxing school for girls. Gulsum Tatar at home in Kadıköy, Istanbul with her cat and her medals from her long amateur career (2003–2017). Boxing is rising in popularity in Turkey, and more women and girls are taking up the sport. The twenty-one-year-old flyweight Serenay Çetin became Turkey’s second female professional boxer in 2018. 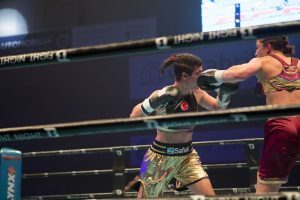 In the eighth and final round, Gülsüm comes out firing, looking for a knockout, but her punches have slowed, and she remains wary of Oshin’s powerful right hand. Twenty seconds to go, but neither can find a way to halt the tight, technical battle decisively. The bell ends the fight. The hometown fighter Oshin Derieuw (left) is awarded the victory over Gülsüm Tatar (right) on points by unanimous decision. Gülsüm’s gloves are untied, and she lifts her fingers to the air with a smile. Oshin looks more anxious. They stand with the referee in the middle of the ring as the judges’ scores are read out: 73-79, 74-78, 74-78, “all in favor of the winner, the woman fighting out of the blue corner . . .” and the referee raises Oshin’s hand. A shadow of disappointment passes over Gülsüm’s face. Then she turns to embrace her opponent. 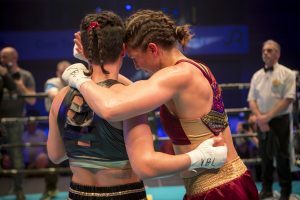 Gülsüm Tatar (left) and Oshin Derieuw (right) embrace after a tough, tight match won by Derieuw on points. Promoters were immediately talking of a possible rematch.